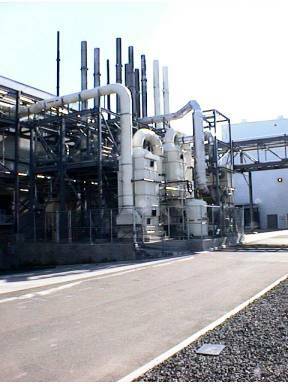 Over many years, extensive work has been carried out on the use of fluidized bed scrubbing systems and ECC continues to advance this technology through academic research and on-site evaluation. In collaboration with specialized scrubber manufacturers who have considerable experience of installing fluidized bed systems, ECC can offer fully operational pilot plants for on-site test work. For a given process specification, initial design recommendations are provided by ECC. Polypropylene and High Density Polyethylene will suit most process operating requirements. For highly aggressive chemicals or at temperatures above 110oC, PVDF should be specified. Traditional absorption towers that employ fixed packing, such as rings or saddles, are strictly limited in absorption efficiency by their available surface area for mass transfer. In general, only very tall towers give high efficiencies and the interstitial structure of the packing leads to rapid blocking when fine solids or dust particles are present in the liquid or gas steams which results in rapid increases in pressure drop and diminished operational efficiencies. Turbulent Contact scrubber towers offer many advantages over static packed towers. Not only are substantial increases in efficiency possible per unit tower height, but much larger gas throughputs can be handled with smaller tower diameters. This leads to substantial savings in both capital and operating costs. A fluidized bed can operate over a wide range of gas velocities from a minimum of approximately 1.8m/s up to a maximum of 3.5m/s. The optimum velocity to ensure satisfactory pressure drops and outlet efficiencies is around 3.0m/s. To ensure that the bed fluidizes evenly, a uniform velocity profile across the tower section is essential. This is normally achieved by baffling the gas at the inlet, however to ensure that a maximum contact and turbulence is generated, the absorption zone is divided into several stages. Usually three stages are sufficient, however when high efficiencies are required or fine solids particulates are present, a fourth stage may be recommended. As the highest operational efficiencies are achieved when the bed is fluidized evenly, it is essential that the liquid is also distributed evenly across the bed. Liquid/Gas ratios normally vary between 1x10-3 and 3 x 10-3, however certain conditions may necessitate the widening of this range. The support grids within the absorption zone support and retain the fluidized elements within each stage. To ensure that the overall pressure drop is kept to a minimum, a high free open area is recommended. Each grid is required to support the weight of the packing and any associated liquid hold-up prior to full fluidization. The flexibility of a fluidized bed allows for improved scrubber performance as legislation on emissions is tightened. Increases in liquid flow rate, gas velocity and packing bed depth can be easily accommodated in an attempt to reduce outlet emissions further still. The physical dimensions of the scrubber will however remain unchanged and costly replacement towers can be avoided.